Last night was a proud moment for all the artists involved in the soundtrack of the Black Panther movie because they were able to witness it for the very first time. 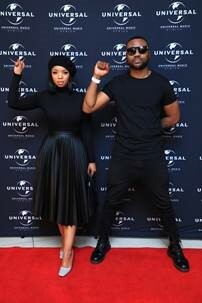 Universal Music Africa, in partnership with Trace Urban and YFM, held a star filled exclusive media screening of the new Black Panther movie at Ster-Kinekor The Zone Rosebank which also extended to celebrating the Black Panther The Album. The red carpet was rolled out with guests such as HHP, Loot love , Reason, Sjava ,Emtee, Babes Wodumo and much more. The movie embodies a colorful celebration of Africa. The statement of this movie is also a reminder of how beautiful and powerful our continent is.